Blaine Ferguson is retiring after 30 years of service in the Utah Attorney General’s Office. After earning both his undergraduate and law degrees from BYU, Blaine Ferguson was admitted to the Utah State Bar in 1977. Blaine joined the Attorney General’s Office in 1986 after almost nine years in private practice. He worked for nine years in the Child Support Section of that office, serving as section chief for six of those years. In 1995 he joined what later became known as the Commercial Enforcement Division. That Division represented the Department of Commerce and most of its divisions, including DOPL, the Division of Securities, the Division of Real Estate, the Division of Consumer Protection, and the Division of Corporations and Commercial Code, and it was also involved in antitrust enforcement. Blaine served as chief of the Administrative Law/Licensing Section of that division from 1997 to 2007. In March 2007 he was appointed as chief of the Commercial Enforcement Division, and he served in that capacity for over seven years. We wish Blaine all the best of luck and success in his future endeavors. 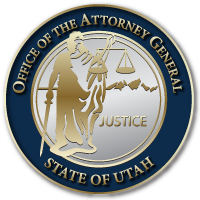 His kindness, attention to detail, and the thorough manner with which he approached all he does will be missed in the Office of the Attorney General of Utah.